So, I feel like watching the Hobbit, and this makes me feel quite strange. Because, I'm very aware that Guillermo del Toro was supposed to be directing the film of the hobbit. GDT is a good director, who's famous for making films that blur terrestrial and fantastic horror, and for films that paint outcast monsters as heroes. He's great at talking about how the scary monsters are the ones under your bed, he has a teriffic imagination, and talked passionately about dragons and his designs. He'd have been great for the hobbit, the childlike hero being thrown into a world of light and shadow. But instead, he walked away from it to persue his own projects; tried to make Mountains of Madness, which got pulled; and made Pacific Rim instead. I loved watching Pacific Rim, and would happily watch it again, but even as a GDT fan, I think it could have been so much better. It was exciting and thrilling, but it wasn't a masterpiece. And as I prepare myself to watch Hobbit, I have the feeling: I don't want to spend three hours watching the first third of The Hobbit. I want GDT's hobbit, with it's deep understanding and humanisation of monsters. Pacific rim felt like top gun, or Thomas the tank engine, when adding some layers of deeper characterisation, dialogue, and even more ensemble, would have been lovely. GDT billed the film as an ensemble piece, and his drive - the fact that we have to work together to survive - comes across very nicely in a show-don't-tell kind of way; that family and ethnic bonds are less important than humanity coming together above those. But most of the ensemble characters are killed off after only a few sentences, and end up feeling like set dressing. 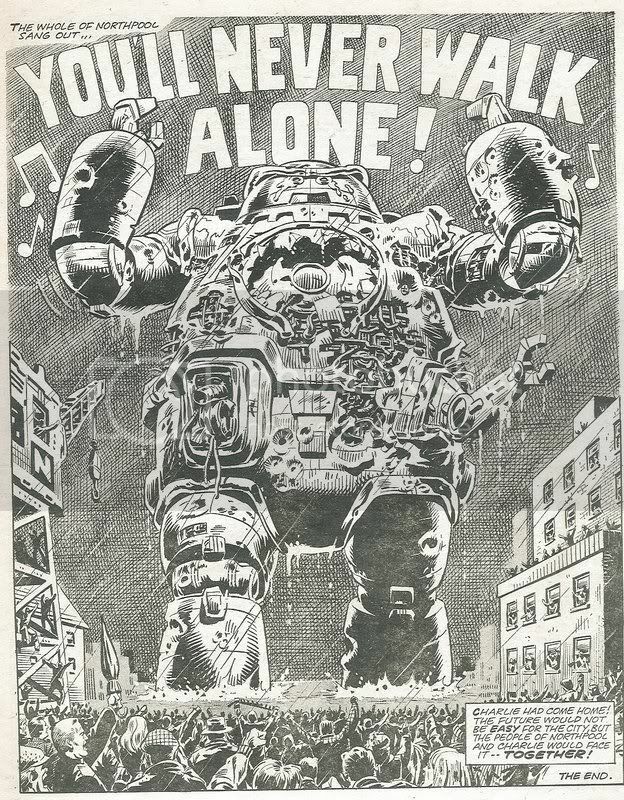 What it reminded me most of - and could have done with being even closer to - was the pat mills/dave gibbons 2000ad story, The Terra Meks, in the Ro-Busters series; a giant port guard robot must protect his town from rampaging demolition robots, who are trying to redevelop it out of existence. The final page, of the battered and torn robot (called Charlie), standing up and walking out of the sea, because he can hear all the humans singing 'you'll never walk alone' makes me well up even now. So back to The Hobbit, part of my issue seems to be how painfully, indulgently slow it is. I mean, then dialogue, not just the pace (I've now watched half an hour of it). When I think of the hobbit, I think of the start, which must be 'in a hole in the ground, there lived a hobbit' and nothing else. That line should not come after we see old Bilbo reflecting and talking to frodo and a story about the dragon, which manages to cut between three time zones in its opening framing story; it must start the film. The other thing I think of is the BBC radio production, which does the whole book in about 4 hours. And that is pacey, snappy, with dialogue that relishes in the humour and snap of excitement. BBC: "I'm looking for someone to share in adventure" said quickly, makes it quite funny how over the top that statement is, especially to a cosy hobbit. Jackson:"I'm... Looking... For someone.... To.... Share.... In an... ADVENTURE." Well no wonder the film is 9 hours long. I keep coming back to it. I keep looking at it sitting on my net flicks account, '25 minutes watched'. I keep thinking, this is a children's book. A short novel filled with adventure, excitement, and ultimately, the notion that despite the subtitle, you can never go home again, because the round trip has changed you. Peter Jackson's first third is three hours long, and a PG. I respect PJ. I think that it would probably work better, if you're telling the story of the transition between the hobbit and the lord of the rings, to integrate that story into the hobbit. But even then, 9 hours is more than. I have time for, and I'm a massive Tolkien nerd. A film of the hobbit should be like the first star wars film. Maybe a little longer than the average film, but an epic adventure that has a happy ending then and there. But then, this is the man who remade king Kong, which didn't need remaking, instead of Q: the winged serpent, which did. GDT's the hobbit is the film I want to watch. Anything else is a disappointment. I'm sure, one day, I'll have a free weekend, and I'll watch the whole trilogy through, and I'll be able to pass comment on it. But I hope've explained why I'm not clamouring to do that right now.